Most games in the Harvest Moon Series require that the player-character be the opposite gender from the NPC they wish to marry (in addition to the characters having enough affection, etc.). 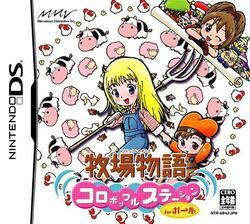 The Japanese version of Harvest Moon DS Cute, a version of the game that only includes a female player-character, includes the “best friend” system. This allows players to “marry” four “special” female NPCs as well as all of the marriageable male NPCs. This feature was removed when the game was localized for Western audiences (Rea, 2010). This entry was posted in 2000s, Changed in localization, Optional Relationship on September 3, 2015 by Adrienne Shaw.